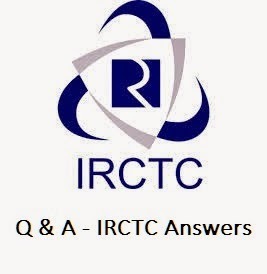 Given here are some of the most wanted answers to questions about IRCTC. Q. What is full form of IRCTC? A. Indian Railway Catering and Tourism Corporation. Q. What is the process of booking tickets online on IRCTC is called? Q. How "Plan my Journey" in IRCTC is accessed? A. By doing IRCTC login. Q. What is new IRCTC reservation system known as? A. NGET which stands for Next Generation e-Ticketing. Q. How many tickets can be booked in a single session on irctc.co.in? A. 1 ticket, system automatically logs out user after that. Q. What are right tatkal booking timings on IRCTC? Q. Who updates IRCTC website? A. CRIS (Centre for Railway Information Systems). Q. Can I book ticket for seeing Taj Mahal on IRCTC? A. Yes you can. You need to visit asi.irctc.co.in. Q. Are all the trains available for booking on IRCTC? A. No. Certain overseas trains cannot be booked. Q. How can I access the old IRCTC site? A. By going to url 'services.irctc.co.in'. Q. How many passengers can booked at a time under tatkal scheme online? Q. How can I check seat availability in a train on IRCTC? A. When you login to do booking the system displays trains based on source and destination stations and date of journey. There you can see the latest seat availability status. Q. Can a railway ticket buyer check PNR status on IRCTC. A. No. To check PNR status one need to go to 'indianrail.gov.in' site. Q. Can I book meals along with train ticket? A. Yes you can. First you need to book ticket. Then using the PNR number of ticket go to 'http://ecatering.irctc.co.in/' and book meals. Q. Can tickets booked online be cancelled manually? A. No. All e-tickets can be cancelled online only. Q. When I buy ticket will the restroom or waiting room will be booked automatically? A. No. You need to go to 'http://irctctourism .com' for booking these facilities. Q. Do I need to pay more for booking train ticket online on IRCTC then what I pay when I buy it from railway station's reservation counter? A. Yes. This is because you also need to pay booking charges to IRCTC. Same applies for ticket cancellation too. Q. Is it possible to force the IRCTC reservation system to allot a particular seat in train? A. While you cannot force the system for booking a seat, the system does provide option for marking your preferred seat. You can then force the system to book tickets only if seats of your choice are available. Q. When was IRCTC founded? Q. What is the fee for registering on IRCTC? A. Rs. 0. Registration on IRCTC is free for Individuals. Q. Are there extra charges for auto upgradation? A. No. You don't need to pay any extra amount for IRCTC auto up-gradation. Q. Where can I see the corporate information about IRCTC? Q. What is the maximum number of tickets booked by IRCTC in a day so far? A. 5,80,000 tickets were booked on IRCTC on March 19, 2014. Q. Is there any portal bigger than IRCTC when it comes to e-commerce in India? A. No. IRCTC is the biggest e-commerce portal. Q. On IRCTC if I want to cancel only some of the persons booked, and not all, can I do so? A. Yes you can. The refund will be made as per railway rules. Q. What is the brand name of packaged drinking water that IRCTC manufactures? A. It is "Rail Neer". Q. What is the name of IRCTC app that works on android phones? We will be adding more to above Q&A. You can also help us by posting some questions and answers in comments below.